In April 1966 twenty retired teachers of Lawrence County OH met to organize the Lawrence County Retired Teachers Association. We have met six times yearly for the last forty-one years. The current enrollment in the Lawrence County Retired Teachers Association is approximately 90. We usually have an average of 30 members at each meeting. Our members retired from: Ironton City, Chesapeake Exempted Village, Dawson Bryant, Fairland, Rock Hill, South Point and Symmes Valley School Districts. Each year we strive to have at least one speaker from the Ohio Retired Teachers Association. Last year we were honored to have the President travel a long distance to be with us. His speech was very informative about current legislative action and other topics of interest. 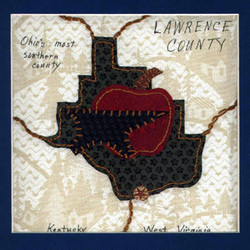 Lawrence County is the most southern of all of Ohio's counties. We are very proud of our riverboat heritage, the superior iron ore produced from 1818 to 1916 and the development of the first Rome Beauty apple. So on our quilt blocks we included the anvil to represent the iron ore industry and the apple that were both parts of our history. The teaching profession continues to deal with a demanding society. We know that the present teachers' job is not easy, but schools are being built, levies are being passed, materials are being purchased and new ideas are being exchanged. With a little sweat, lots of patience and a sense of humor, these teachers will survive.